Kids and Nature I believe that children need nature and that nature needs kids to be in it in order for our world to survive. Thanks to a fitbit that my sister gave me and a desire to “walk the talk,” I have decided to start a nature challenge. My goal is to go outside for a minimum of 30 minutes every day, for a year. Ideally, this will be active time outside – walking, hiking, snowshoeing – but I’m also hoping to take some time to reflect on my experience. I’m also going to try to blog about it as I go. I don’t promise that I’m going to do a great job at it, but I’m going to try. Finally, I’m going to try to make sure that I do as much of this as possible with my son. As you no doubt can tell, he loves being outside and has a great time with it. Along the way, I will tell you about where we went and what we did and what made it easier (or could have made it easier). I hope you enjoy it. With that in mind, today we went skating in Calgary’s Bowness Park. The park has been closed for ages, having been hit hard by the 2013 Calgary Flood, but it’s back in business and better than ever. The new tea house (which isn’t open for tea yet) has a great bit deck out front with gas fireplaces – a wonderful spot to sit and put on your skates! I’ll be honest, I would have been happy just to hang out by the fire and relax, but it seemed like a good idea to at least do a few laps of the pond. The ice is a little bumpy (isn’t all outdoor ice?) but it’s a very kid friendly spot – people watch where they’re going and there aren’t any hockey games. Don’t get me wrong, I like hockey, but it doesn’t mix well with teaching your kid to skate. Our son and his new friend also discovered that the shore is a great spot to find but chunks of broken ice – a pretty cool diversion when you’re six. He would have played for hours, making forts and throwing snowballs but us adults were getting a bit bored. Next time, we will bring folding chairs and a thermos of hot chocolate and just let the kids play. 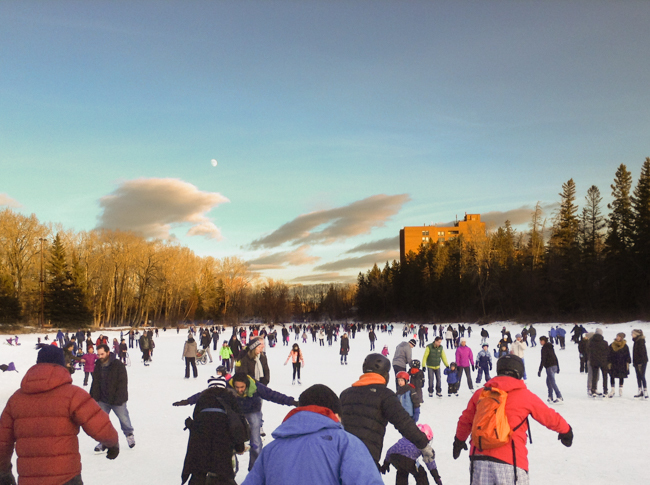 Most communities have some kind of outdoor rink. It’s an easy, inexpensive way of having a bit of outdoor fun as a family. Such a nice fun afternoon!